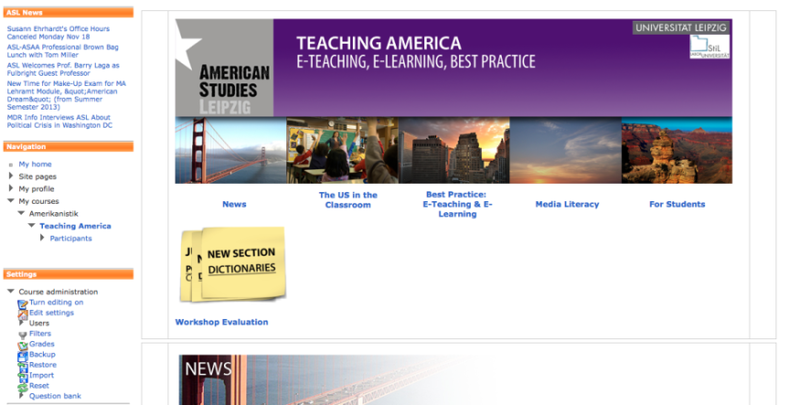 Teaching America is a new project that wants to bridge the gap between university learning at American Studies Leipzig and high school instruction in the region of Saxony, Germany. Our goal is to make new media content on American topics more available to high school teachers in the region as well as to train American studies students, whose plan is to become teachers, to research and think about how to use such content in the classroom. Central part of the project is an online portal. The portal serves as the link between students and teachers. University students will be researching material available online as well as preparing teachable lesson plans based on new media content. These units will be included in the portal and will be available for teachers to integrate them in their classrooms. The portal already contains a wide variety of content and is updated regularly by a small group of graduate students in charge of the project. We have contacted teachers in Saxony, informed them about what is happening with the portal and with the project as a whole, and have planned for the next phase of the project, when students will begin to upload custom-made material to the portal. High school teachers have been quite responsive and interested in how to better use new media in the classroom; they are excited about the existence of a platform that assists them with material on American history, literature, society, politics, and culture, and that thus fills gaps in the existing curriculum. The portal consists of different sections, offering a wide-ranging selection of materials on the United States. The five main glossaries are arranged by topics (Politics/History/Education, Literature/Culture, Economics/Ecology, Global/Transatlantic Issues, and Diversity), making it easy for teachers to search the database. The content is further divided into smaller categories, for example video, audio, quiz, or interactive. So far, we have gathered a wide selection of material on many different topics: from historical events—like the Civil Rights Movement and the Cold War—to historical and literary figures—like Martin Luther King Jr. and President Barack Obama, or Nathaniel Hawthorne and Mark Twain—to issues related to the economy and environmental concerns—such as the Financial Crisis, fracking, and climate change. The content specifically created by the students at American Studies Leipzig will be eventually included and characterized by an ASL icon throughout the glossaries. In addition to the core glossaries, the portal provides links to useful teaching tools like online dictionaries, podcasts, maps, e-books, and cartoons. Starting next summer, groups of students will come up with and develop topics and concepts for entire lessons (one and a half hour) from scratch. The themes will correspond to the curriculum of Saxony’s education plan to make it easy for teachers to plug them into their teaching plan. These units will then be uploaded on the portal as ready-to-use in the high school classroom. University students will not only create new content and new lesson plans for Saxony’s high schools but they will also have the opportunity to teach the new content. First this will be possible as part of their course in front of their fellow students, and eventually they will use the material in a high school in Saxony as part of their training to become teachers. This way, the project not only serves as a content production platform but also as the missing link between university education and the practical reality of being a high school teacher. Once the university seminar is in full swing, we will have created a circular system of knowledge production and exchange between high school and university. Through this project, American Studies Leipzig tries to create a sense of community between the different forms of education in Saxony, with a focus on innovation and integration. Eleonora Ravizza is a PhD candidate at American Studies Leipzig, where she also teaches courses on American literature and film. She is writing her dissertation on Nostalgia for the Fifties in Contemporary Popular Culture. Claudia Müller is a doctoral candidate at Technische Universität Dresden and Leipzig University, writing her doctoral thesis on the Stereotypical Image of the Fat Poor in Contemporary American Literature and Culture. Maria Lippold currently works as an Assistant Lecturer at American Studies Leipzig where she is also a PhD candidate. After receiving her BA and MA degrees from the University of Leipzig, she is focusing on Japanese North American Literature from Hawaii and Canada in her dissertation project. Eric W. Fraunholz is a second year graduate student at the Institute for American Studies Leipzig. He has been part of the project from the very beginning. He is responsible for the overall conceptualization and technical implementation of the portal as well as for research. His research interests are critical theory, notions of conflict, and their intersection with cultural studies. Crister S. Garrett is Professor for American Cultural History at the Universität Leipzig. 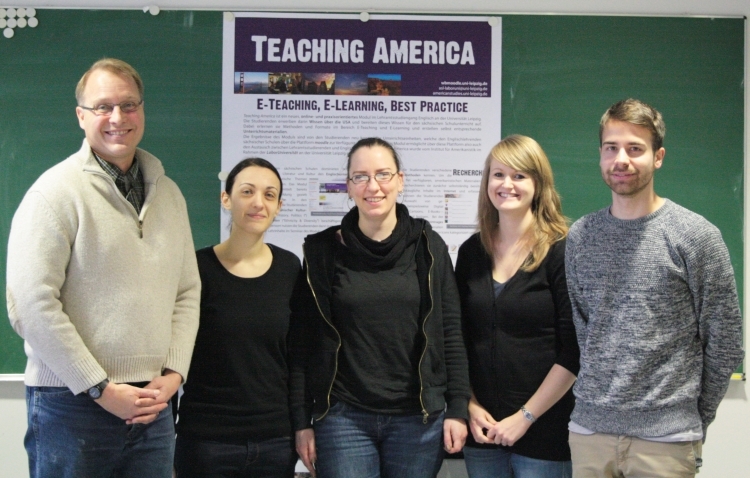 He has directed the Teaching America Project at the Institute for American Studies at Universität Leipzig. The Project was generously funded by the German Federal Government as part of its support for the “Study in Leipzig” (StiL) Initiative.